It is eminently human to be curious. People of the great civilisations of the ancient world must surely have wondered about what lay in the great wilderness out there. Where would it take them if they travelled beyond the known realms and explored further on? This is the stuff of the richly layered mythologies the world over. The imagination always populated the great beyonds with fantastical creatures, and wove stories around them. Nothing was so far-fetched that it was impossible. The stories were often with the familiar elements of human experience. As civilisations flourished and started looking beyond themselves, they began exploring the wider world outside their reach. And they were often pleasantly surprised with what they found. That, and the following 5000 years, to date, is what this book is all about. As the name of the book says, it is indeed one continuous story, interlinked with fun facts. One journeys through around 5000 years of the history of exploration of our world. 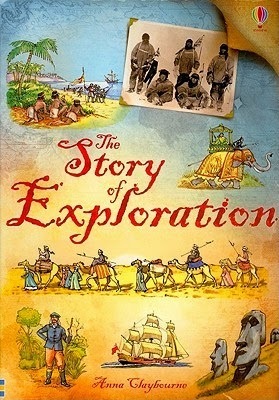 The richly illustrated book describes the successes - and failures - of explorers through history, from the ancient Egyptians to the travels of Marco Polo, from Christopher Columbus’ arrival in America to the discovery of Australia and its colonisation, right up to the latest explorations of the deep seas and outer space. Illustrated by Ian McNee, with cartoons, simple diagrams and maps that explain much in a few words and many visuals. There is a detailed timeline of explorations and journeys that contributed much to our understanding of topographies, time zones and maps. For those interested in exploring further, there are internet links to websites with additional pictures, maps, animations and exploration facts. *timeline from 2200 B.C.E to 2003 C.E. Sounds like a great companion book to 'Into the Unknown' - reviewed earlier by Vibha. Link that book review of Into the Unknown by Vibha. We have this one Sandhya - awesome review!